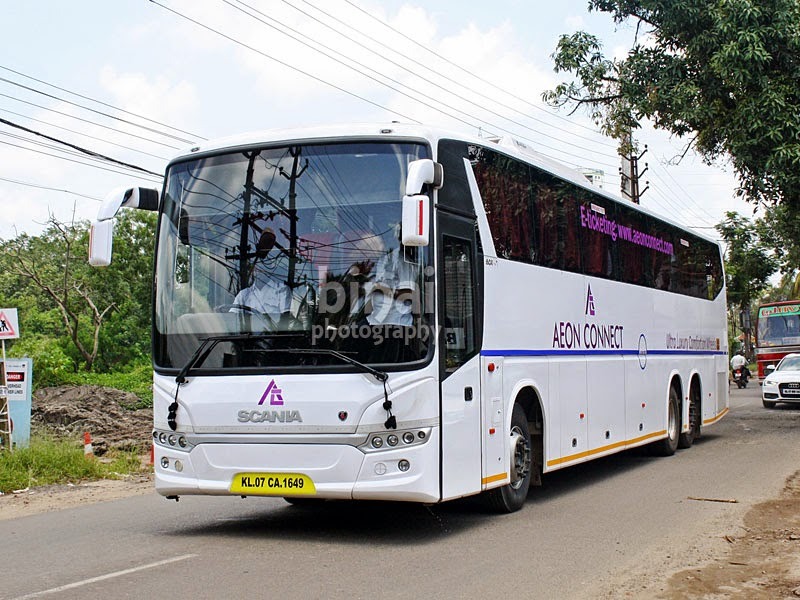 Aeon Connect - Thrissur to Bangalore in a Scania! I had come to Kerala driving my car, and was leaving the car behind at my home. I had a reservation in an Airavat Club Class, but had later cancelled the ticket since I decided to travel a day later. Now the challenge was to find out a bus for my travel. For some reason, I decided to look for day buses. Aeon Connect's Cochin-Hyderabad service turned out to be an obvious choice. I made a booking using their own website and purposefully selected a seat towards the rear of the bus. I left home sometime around 1pm, after my lunch. A KSRTC bus dropped me at Thrissur KSRTC Bus Station a few minutes past 2. My appointed pick-up point was right outside the KSRTC bus station in Thrissur and the scheduled reporting time at 1425hrs. I had some difficulty finding out the office of the travel agent (Saffari Travels) since the address mentioned on the ticket was incomplete. Another travel agent directed me to the office of Saffari Travels. The guy at the office looked bewildered as I walked into the office and showed him a ticket. He was confused about the ticket and look at the ticket a couple of times. He then made a phone call to find about this booking and then told me that the bus doesn't come here. He said it has a pick-up point only at the bypass, and I needed to go there. Now, I did not expect the bus to come to the town to pick me up in the middle of traffic, but I surely expected that they provide a pick-up service when they show the town office as a pick-up point. I quickly reiterated that they need to provide me transport facility to get to the pick-up point. The office guy quickly called an auto, directed the auto driver about the pick-up point and paid the auto fare. That was a good gesture. The pick-up point was on the road side - no shelter, no office. There was an abandoned table on the roadside, on which I could rest my bag. A while after I reached, the Hyderabad bound Volvo B9R of Kallada reached. My bus turned up exactly at 1500hrs. As the bus came close, I saw the ever familiar Wilson inside - he is a veteran driver with years of experience driving in the Kerala-Bangalore route. He waved at me and stopped me quickly - he welcomed me in, and helped with the bag. A bus host was present, who quickly marked me present. The bus was already running by now, and we were headed towards Palakkad. I headed to my seat #I1. The bus was mostly empty now - just a few passengers scattered around. The humongous overhead luggage rack swallowed by fairly heavy and big baggage quicky - the rack is deep and tall, which makes loading very easy, and luggage stays inside well. This was my second ride in a Scania - and the first one during day hours. I was quite impressed with the quality of the material used, and the interior finish was top class. The seats were of Harita make. 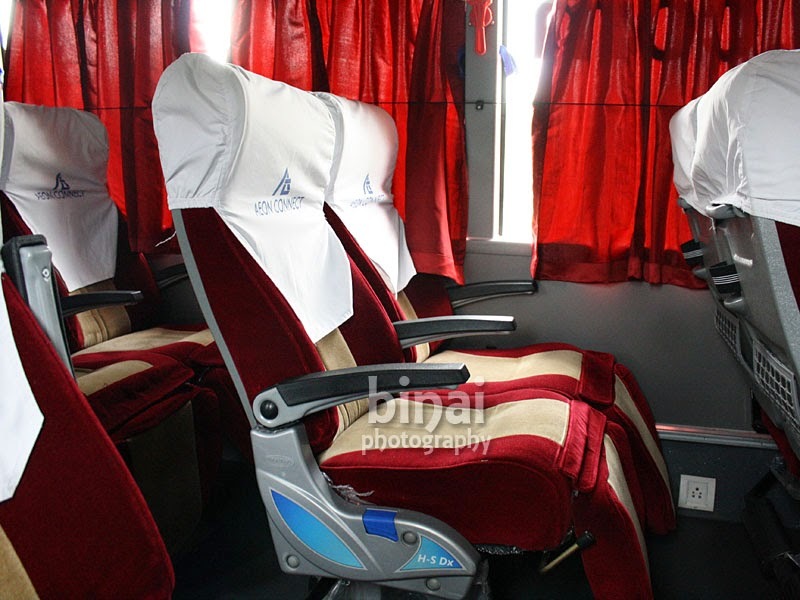 The coach was quite cold - because majority of the passengers had no idea how to close the AC vents. The attendant was quite pro-active and was helping out passengers who were struggling with the AC vents. Sometime after leaving Thrissur, a fairly recent Malayalam movie was played - the attendant came around to open to the TV Screens at the back. He also issued a blanket to me before going back. 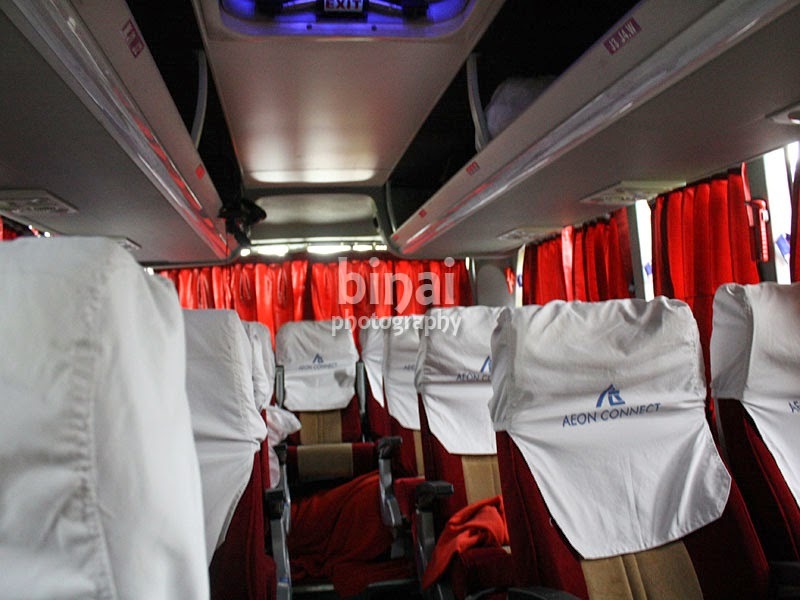 Unlike other buses, the blanket wasn't kept on seats, but neatly folded and kept on the last row seats. That looked professional unlike the blankets kept on the backrests as if its kept to dry. 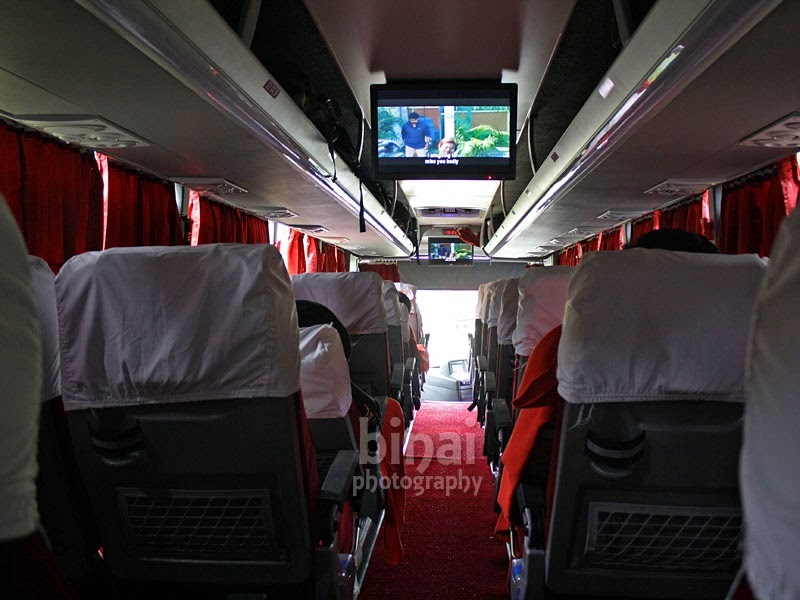 I was enjoying every minute in the bus - it did not sway around on bad roads, nor did it bounce like a ping-pong ball. It handled the broken roads with ease. The monstrous 13 litre engine was letting the driver make overtakes with ease. The sound and video quality was simply great - the volume was perfect, and the sound effects great. We picked up a few passengers from Palakkad, and started at 1615hrs. Four laning works were in progress and this meant we had a lot of diversions - the bus kept shifting from one side to the other due to the diversions. The bus handled the diversions quite well - it handled the rough patches with ease. In the meantime, I checked with the comfort level at the last row as well - the AC was very effective even there, and the typical engine heat was absent here. 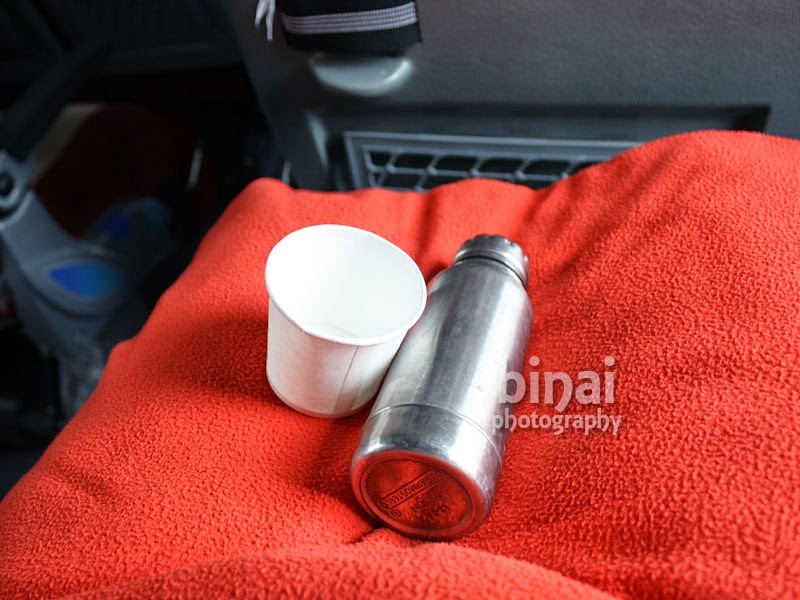 Tea was served to all passengers in small 300ml thermo-flasks along with a small disposible paper cup. This eliminated the need to stop for a tea break. There was a traffic block at Walayar and we lost a few minutes here. As the bus exited the Walayar snarl, the crew called up their Coimbatore agent and asked them to get the passengers to the pick-up point in time. As the movie got over, I decided to observe the engine notes - the engine was silent. I could hardly hear the engine - this was quite different from what I observed in the KPN bus. We reached the Coimbatore pick-up point - just past Neelambur toll gate at 1740hrs - boarding took sometime here. About 10-15 passengers got in here, and we started off at 1743hrs. I loved their time management - absolutely no time was wasted. The pick-ups were well co-ordinated. The crew did not waste any time as well - they kept constant pace all the time. I was quite surprised - they took just around 2h40m to do Mannuthy to Coimbatore bypass - and they were off after pick-up in 3 minutes flat! The bus maintained constant pace once we were on the four-laned road. The crew concentrated more on maintaining pace than trying to speed hard to get the pace and then brake hard. We pulled into Saravana Bhavan just past Vaigundam Toll Gate for dinner at 1916hrs. I was still trying to recover from the shock! We were almost at Salem by 1916hrs!! The service at Saravana Bhavan was unusually lousy - but the bill was hefty as usual. After dinner, I spent sometime looking deep at the bus. I spent sometime talking to the drivers about their feedback - they were thrilled as they spoke about the bus. They were happy about everything in the bus - the seating, the consoles, the engine, everything. I was happy hearing their feedback - and, this proved Scania was here to stay! They spoke high about its fuel efficiency, braking efficiency and ride quality - I agree with them as well. Ride and braking was top class. The retarders were too good, they never threw me ahead. We started after Dinner at 1951hrs. The Harita H-S Dx seats in the Scania. I was engrossed in my phone, and didn't really notice where we were. I was shocked and surprised when I looked out of the window - we were in Salem! The time was 2020hrs. So that was 5h20m from Thrissur to Salem, including a 36 minute dinner break! All this with a bus that is locked at 100kmph! We started off from Salem at 2021hrs, after picking a single passenger. I was now sure that we'd reach Bangalore perfectly on time. Wilson was at the wheels now - he was proving what experience means. Perfect lane selection, sticking to the correct lanes at toll gates, well timed overtakes, absolutely no harsh brakes or rash cuts. I was loving every moment of the ride. I was quite sleepy, but was a bit afraid if I'll oversleep. I had informed Wilsonbhai that I wanted to get off at Bommanahalli - for which he promised to drop me at the end of the BETL flyover. I spent time browsing on the phone - the mobile charging point was on throughout. My adjacent seat was empty throughout the journey. I got set to get off as we passed the Electronic city toll gate. I was dropped at the end of the flyover at 2313hrs - well ahead of the promised arrival time of 2330hrs! I thanked Wilsonbhai as I got off the bus and set off on a long walk to Bommanahalli junction, from where I took an auto home. End notes: The bus was KL-07-CA-1649 - and she had clocked 96000kms when I got in to the bus. There were two drivers, a "host" and an attendant. The bus was clean inside-out. The cooling inside the bus was very uniform - there were no hot pockets inside. The gangway was a bit narrow - I felt a bit of a difficulty walking through with my baggage. The interior lighting looks resplendent. The light is a mix of the regular white flourescent lamps with blue leds, It lights up the cabin really well. The overhead safety hatches have small blue leds which help passengers in getting to the hatch, as well as serving as a light lamp when the cabin lighting is switched off. The ride quality left me speechless - the cabin was silent and did not bounce around. Overall, the Scania is surely the future of Indian transportation. The competition needs to pull up its socks quickly, else they are certain to lose the battle. As a bus fan, I missed the grunt and roar of the engine, but for a regular passenger a silent cabin would be more welcome. The driving was great - no rash cuts, no harsh brakes, no excessive honking. Entertainment: Yes. Two movies played. Will I take this service again? Absolutely! The only problem for me is the timings! Journey Details: Bus: AEON Connect Scania Multi Axle Semi Sleeper (2+2). Reporting time: 11:15 PM. Fare : Rs. 1600. Vehicle No: KL 07 CA 1639. Crew PH : 08138911639, AEON Owner PH : 0949 700 4466. I boarded the 11:30 PM bus from Madiwala, heading towards Aluva. I was carrying a laptop bag (with a laptop in it) that didn’t weight more than 4-5 kilos at the most. I was initially told to leave the bag in the luggage store area between the other bigger bags from other customers. I clearly couldn’t let that happen because the bus driver and the crew member didn’t behave properly starting right then and gave no assurances to the . My laptop also wouldn’t have been safe between other larger bags. Hence I decided to keep it inside the bus, in the overhead space. Then after few hours I realized that seats full of bedbugs, totally Helpless. At around 6:30 in the morning, almost near Palakkad, I felt nauseous and had a very intense sensation to vomit. I was diagnosed with an Intestine Infection on 4th Feb and was very weak. Being an AC bus, with the windows all closed, I could only think of requesting the bus crew to stop the bus for a minute so that I could puke and get back on. They were very aggressive in their reply and said they won’t stop even for a second citing traffic. I was forced to throwing up inside a plastic bag in a moving bus. I do not wish this even on my worse enemies. Once I reached Aluva, where I was supposed to get off the bus, I confronted the bus driver as to why he didn’t stop. The bus driver got up from his seat, took a very aggressive posture and pushed me out of the bus. It escalated to pushing and shoving between myself and the bus crew member and the driver. Luckily there were a few policemen where I got down and they intervened. I was very weak, and had an extreme sense of having been wronged. It clearly isn’t the kind of treatment any passenger deserves. All I asked for was for the bus to stop for 2 minutes!! Not only did they not stop, they also threatened to beat me up. After I reached home, I rung the owner of AEON travels, who was least bothered to listen to my grievance. I feel cheated, abused and exploited in this bus trip and will never ever be using AEON again. A very big warning to anyone using Redbus to book tickets: Please choose the travels carefully and as much as possible, avoid these expensive and troublesome bus rides. I will be putting this up on whichever forum I can to create awareness. I had a to and fro journey from Hyderabad to cochin last weekend, and I had a decent experience. On the way to cochin, the bus was late by a hour and half due to block at madivala and hosur. On the return journey the bus was on time throughout. The return journey were all the more comfortable as the drivers and the cleaner were always in smiles throughout the journey. Never book tickes on Aeon Connet Scania bus especially ladies. My sister had a very bad experience on this bus. She booked the ticket from hyderabad to ernakulam through goibibo. At the time of booking she selected the side seat D4. Ehen she took the bus the bus driver said to change that they changed the seat to some other seat. When she said she wont change the seat the driver was using abusive words. After that I called the bus owner(09497004499) he was threatening me. He was telling that he don't know who he is and he is telling that he a leader in ernakulam and all. And some abuse words about my sister. I never expected such kind of things from a bus operator and owner. After that one male passenger entered the bus and they made him to sat with her. At last she has to change the seat. I kindly request you to never book tickets on this bus. If you are booking for your sister or wife please do book on any other bus or by train or flight. Your sister or wife will never be safe. Prevention is better than cure! !